Do you have what it takes to run a football routine correctly and in time to catch a winning touchdown pass? 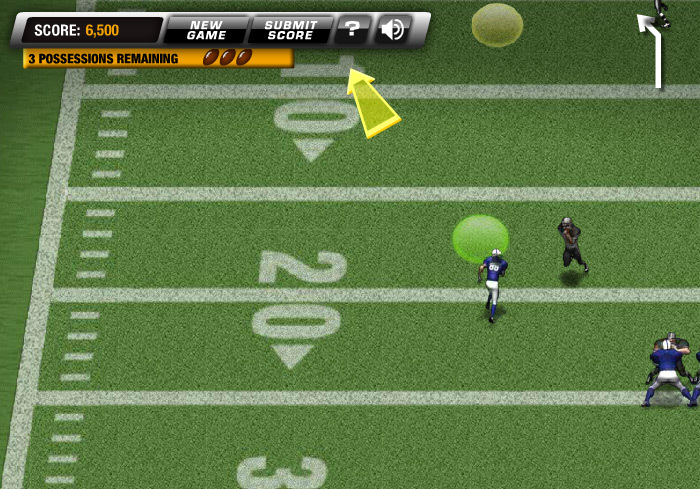 Test your skills in Return Man – Wideout! 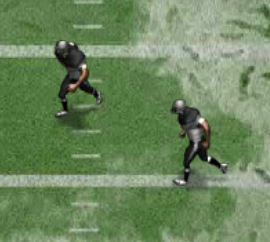 In the Wideout version, you play as a receiver, running down the field with a play stuck in your head that you’ve practiced countless times. Your job is to carry out this play correctly, and make it into the yellow circle in time to make the winning catch leading to a touchdown. Be careful, though. You don’t want to get there too early or too late! 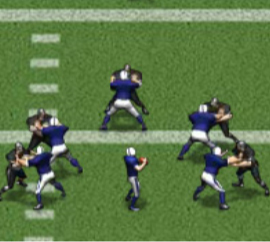 If you reach the circle too soon, the defenders will block the pass. If you get there too late, the play will result in an incomplete pass and a possession loss. Lose a total of four possessions and it’s game over for you! 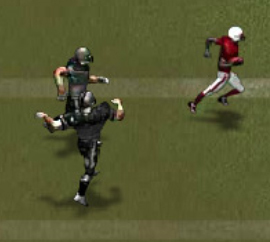 The controls in Return Man Wideout are pretty straight forward. 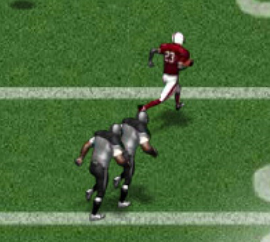 Players use the I, J, K, and L buttons on their keyboard to move the receiver in the direction they want him to run. 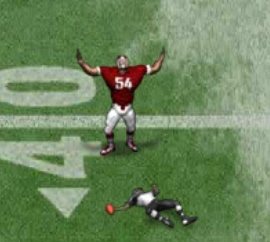 Using the spacebar during the game at the appropriate time will allow you to catch the football, scoring the winning touchdown! In addition to these basic key functions, you can also press the M key to mute the game’s sound effects, and if you press the spacebar while on the score sheet page, it will continue the game into the next level. Alternatively, you could use your mouse to click the continue button on the screen. 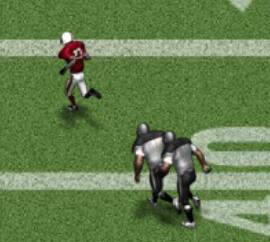 Return Man Wideout features many different playing levels. 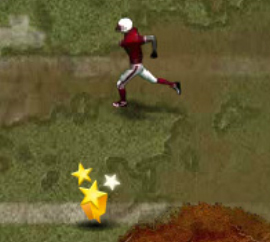 Completing certain levels will unlock the three valuable special moves that your football star can perform to ensure a successful play. 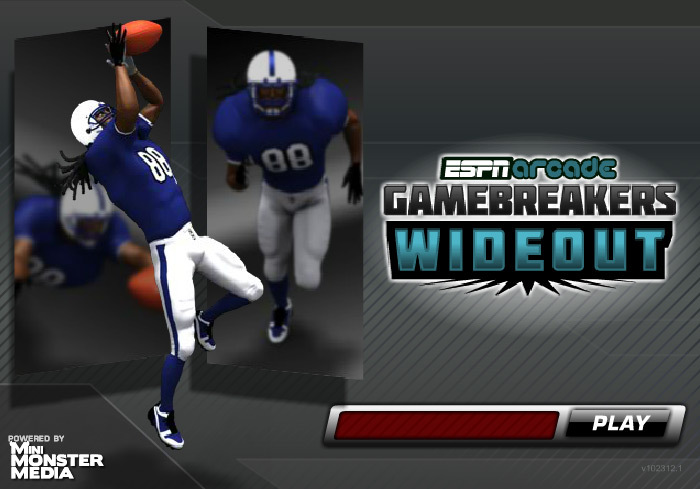 These three special moves are: Jump Catch, Afterburner, and Diving Catch. 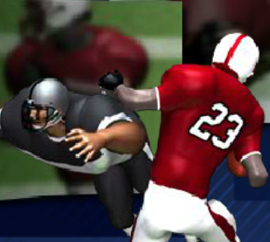 These special moves become invaluable when you are face with near-impossible catches in the higher levels of the game! Press A to activate the Jump Catch special move. Press S to activate the Afterburner special move. 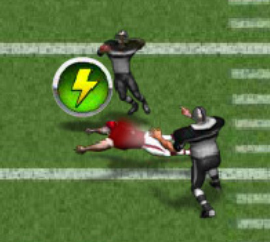 Press D to activate the Diving Catch special move. If you’ve ever played any of the previous versions of Return Man, you are aware of how tricky the games can be. Return Man Wideout is no different, although some believe it to be harder than others! If you are struggling to complete a level, test out some of these tips from experienced players and watch your score soar! 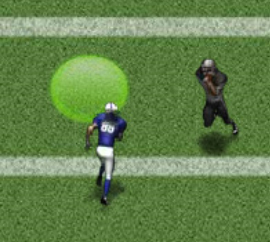 While the in-game instructions do not mention this helpful piece of advice, at the start of each level you will see a yellow circle in the end zone, as well as green circles along the field. These green circles are designed to help you carry out the plays correctly. Run through each of the green circles before making your way into the yellow circle to make the catch! If you’ve forgotten the play you are supposed to carry out, you can look at the top left corner of your screen to help you jog your memory. In this area you will find the play that you are set out to perform, but don’t forget about those helpful little green circles! Try to avoid the defenders as much as possible. They are only trying to slow you down so you’re stuck with an incomplete pass instead of a winning touchdown catch.